UFC welterweight champion Tyron Woodley reacts to reports that the legendary Georges St-Pierre is set to announce his retirement from mixed martial arts (MMA). Earlier today (Wed. February 20, 2019) it was reported that ex-UFC welterweight king Georges St-Pierre is expected to announce his retirement. The decision comes after failed negotiations between “GSP” and the UFC to book a fight between the Canadian legend and lightweight champion Khabib Nurmagomedov. The news has certainly taken the mixed martial arts (MMA) community by a bit of surprise. St-Pierre signed a new multi-fight deal with the UFC in 2016. The only fight on that deal that he participated in was against Michael Bisping. “Rush” submitted “The Count” in the third round of their UFC 217 pay-per-view (PPV) headliner to win the middleweight title. However, St-Pierre later vacated the belt due to health issues and hasn’t fought since. At this point in his career, legacy is the most important thing to the 37-year-old. After failing to make a fight that would’ve added to an already legendary legacy, St-Pierre has apparently decided to hang up his gloves. 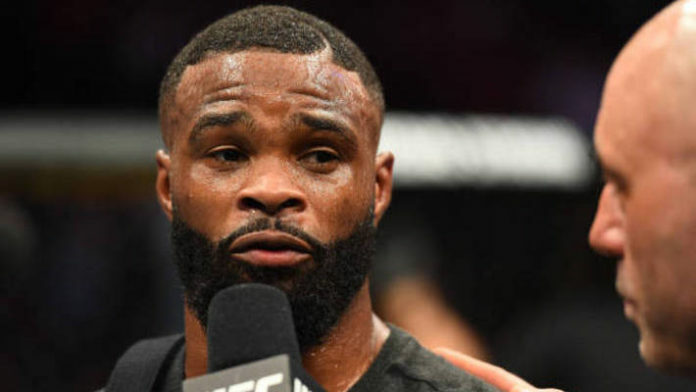 Current UFC welterweight champion, Tyron Woodley, reacted to the news on social media. What do you think about Woodley wanting to cross paths with St-Pierre in the gym?